Con Man (2015) : Série TV de 1 saisons et 15 épisodes diffusée sur Vimeo. Casting, acteurs, bandes annonces et actualités. 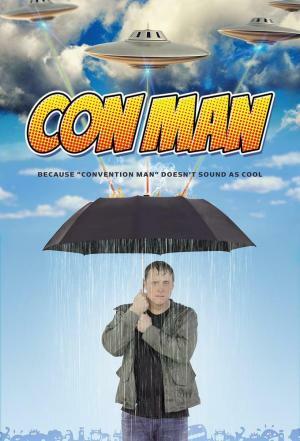 Casting de la série "Con Man"
S01E01 Stalled 30/09/2015 Wray Nerely experiences an unusual fan interaction in the airport men’s room and after accepting some timely advice from Sean Astin, is almost ejected from his flight by Air Marshall Cahoots. S01E02 Cash Poor 30/09/2015 Wray meets his convention assistant, Karen, who is a machine, a machine, a soft serve machine. Wray signs autographs for his fans and agrees to work on his audition scenes with his manager Bobby. S01E03 Behind the Lines 30/09/2015 Bobbie tries to help Wray with his audition. Bobbie hinders more than helps. Mocap-king Jerry Lansing pushes pain killers on Wray. Wray feels no pain at the VIP party. S01E04 Retarding It All Up 30/09/2015 The morning after the VIP party Wray discovers that he recorded and sent in his audition during his drug and alcohol fueled blackout. Wray insults the fans and apologizes only insulting them more. A handicapped mob forms and gives pursuit. Sean Astin gets bourbon balled. S01E05 Baby Boom 07/10/2015 Wray meets the girl of his dreams and knocks her off her feet. Bobbie competes in a cosplay contest judged by the amorous Leslie Jordan and Sean Maher. S01E06 A Fluid Thing 07/10/2015 Bobbie’s “levy” is cresting under the tempest of Leslie Jordan and Sean Maher’s attention. Wray gets an action figure, “Wray Wray”, and learns the love you can only feel as a father. S01E07 Doll Faced 07/10/2015 Wray and Louise make-out-ish in a blue police box. Hearts and more break over dinner and it’s revealed that Wray Wray is getting action. Leslie, Sean and Bobbie work out their own issues. S01E08 Voiced Over 14/10/2015 Wray’s role is downgraded during a video game gig. Milo Ventimiglia convinces Wray to attend a comic book store opening in his absence. S01E09 Sinking Feelings 14/10/2015 Wray meets Jack Moore's new assistant Faith and she informs him Jack wants to make a spectrum movie much to Wray's disappointment. S01E10 Thank You for Your Service 14/10/2015 Michael Dorn and Kevin Gevioux host a panel on racism in animation with Wray. Wray is an equal opportunity bigot. The military rescues Wray from himself. S01E11 Full Release 21/10/2015 Spectrum's creator leaks the lost episode of the show and breaks the Internet. Bobbie, Wray and his 90-year-old roommate and former stuntman-for-actresses, Dale, watch it together. S01E12 Found and Lost 21/10/2015 The cast of Spectrum (save for the late Bruise Camp Bell) has a reunion at Jack Moore's house, where they watch the lost episode and consider whether to do the Spectrum movie. Jack's pulled over by a cop, who's luckily a huge fan. S01E13 Too Much Closure for Comfort 21/10/2015 During the reunion, Wray has a one on one with each of his Spectrum co-stars and realizes how much doing the movie means to them. Also, his militant co-star Stutter, who still holds an old grudge against Wray, exacts his cheesy revenge. Envie de parler de Con Man ? Les discussions sont là pour vous. Retrouvez toutes les informations sur Con Man lancée en 2015 : synopsys, casting complet, acteurs, scénariste, réalisateur. Découvrez des séries similaires à regarder également. Faites vous une idée de la série grâce à la note des membres et aux critiques des internautes.